October is the anniversary of a landmark recording in zydeco. 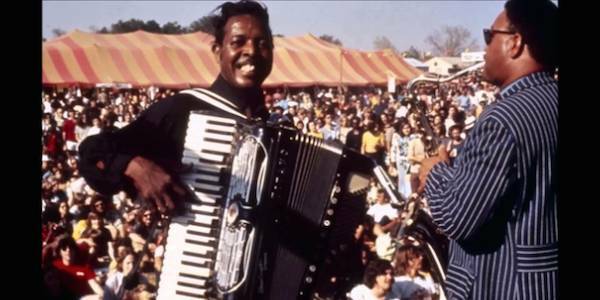 Clifton Chenier and his Red Hot Louisiana Band trekked to the Studio in the Country, in Bogalusa, Louisiana to lay down Bogalusa Boogie. In one single day, Oct. 27, 1975, they recorded eleven classic tracks from the bluesy “One Step at a Time” to the rocking “Sa M’Appel Fou” (“They Call Me Crazy”). Producer Chris Strachwitz said, “This recording session was one of those rare events where everything went just right.” The Rolling Stone Record Guide gave the record its highest accolade of five stars. In 2011 it was added to the Grammy Hall of Fame, honoring recordings of lasting significance. Clifton sings in French and English and plays piano-key accordion and harmonica with his powerhouse band: brother Cleveland (rubboard), John Hart (saxophone), Paul Senegal (guitar), Joe Brouchet (bass) and Robert St. Julien (drums). Clifton’s gone but that one day in Bogalusa lives on.